Kingston Technology has been in business since 1987 and is a well known manufacturer of data storage and volatile memory products. 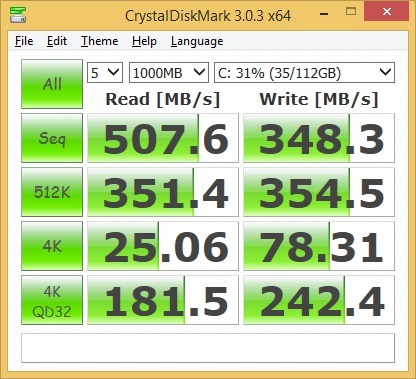 In this article we get to put their smallest SSD through its paces. Whilst we haven’t seen the Kingston M.2 2280 120GB SSD in many of the more prominent retail / online stores, it is available in Australia. The SSD is tiny and comes packaged like a standard issue RAM module. It is quick and easy to install, you just slide the contacts into the M.2 slot on a slight angle, then flatten into place and the fit the motherboard screw to secure it. 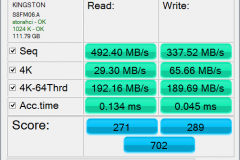 We did run into one glitch with this SSD and that was with our ASUS Maximus Gene VI motherboard. the module that holds the M.2 SSD is close to a motherboard heat sink and doesn’t accommodate an 80mm long SSD. Fortunately our MSI X99S Gaming 7 motherboard has the slot on the mainboard between the PCIE slots and we didn’t have any issues at all when fitting it there. So check your clearance before buying an M.2 storage device. M.2 was also known as Next Generation Form Factor (NGFF) and is relatively new to PC motherboards, replacing the older mSATA slots with anew more flexible technology. Although aimed at Ultrabooks and laptops, we are seeing more motherboards designed with M.2 sockets in between PCIE slots and also mounted on the underside of some smaller MATX and mini ITX boards. Kingston has gone with the PHISON PS3108-S8 NAND controller for this device as opposed to other popular controllers such as SandForce or Indilinix. 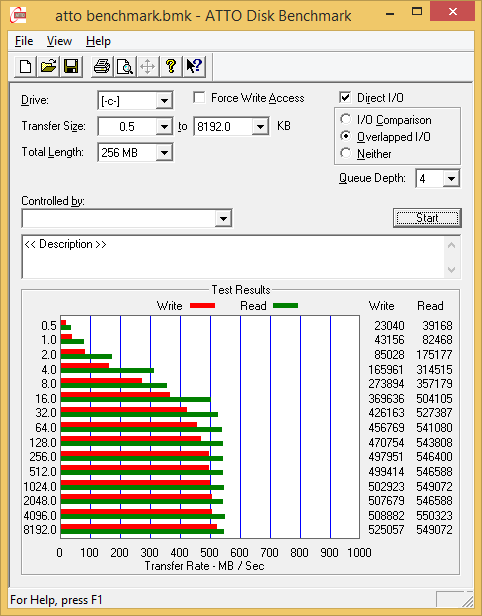 We will go through the specifications first, then validate our test unit against them to see how the SSD performs as a system drive. 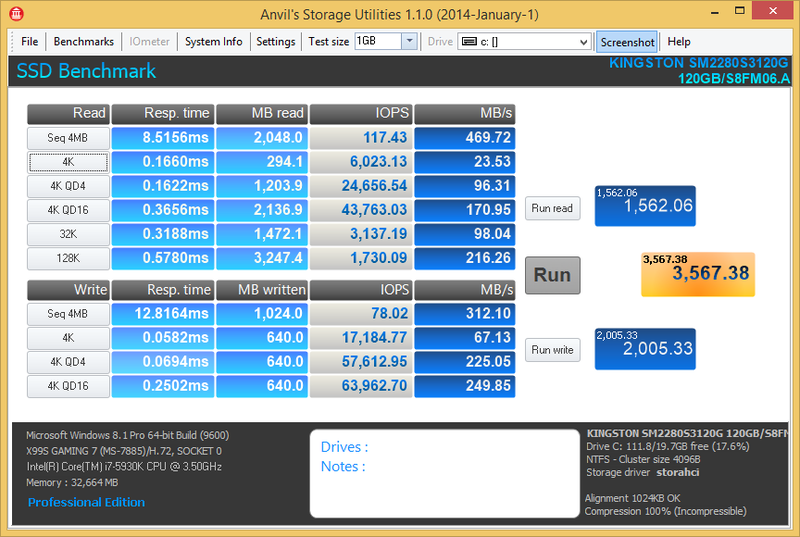 We ran the review unit through it’s paces with anvil Storage Utilities, ATTO, AS SSD, Crystal Disk Mark and PCMARK 8 to get some metrics for comparison against the specifications. 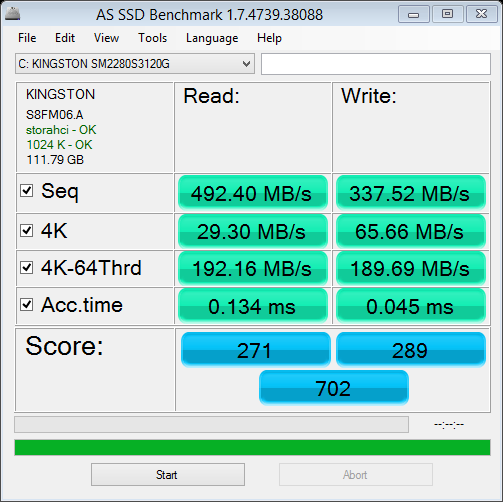 All up, the Kingston M.2 2280 120GB SSD does what it says in the specifications. It’s easy to install, doesn’t need any power or data cabling and makes for a really snappy boot drive. in our case, it wasn’t big enough to really load up with the bare essentials from our steam or Origin libraries so I’d be grabbing a 240GB if it was for my personal rig. The 120GB size would best suit a Media PC that connects to a NAS or dedicated LAN gaming rig that only plays 1-2 games such as League of Legends or DOTA 2. That said, a 120 for a boot partition is plenty and you can make that 120GB go a little further by following a few simple steps. Turn off Virtual Memory / Paging File – it eats up space and if you’re running 8GB or 16GB or RAM it’s not going to be needed. Turn off hibernation – this is as simple as going into a command prompt as Administrator and running “powercfg /h off”. 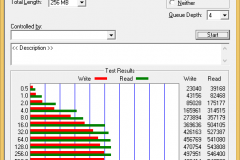 This will stop the system from reserving a portion of the boot drive for saving a memory dump. Links to other storage can also be handy for Apple device backups or download locations. Google the “mklink” command and experiment with something unimportant. As with all the above suggestions, google them first to understand the implications and use at your own risk. The gallery below shows the drive installed in our test bench and later the practical build. We really enjoyed using the Kingston M.2 2280 SSD in our Cosmos SE build and can’t recommend it enough. Our motto is always to aim for a neat and tidy case and with motherboards now having decent on board sound and LAN, it makes sense to add one more thing to the main board and reduce the cables and clutter where possible. The going rate for the 120GB version that we reviewed is around $120 which is a little more per gigabyte than some of the larger drives. 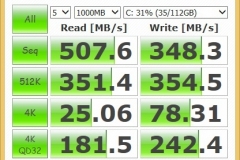 If you have a vacant M.2 port on your motherboard, make use of it in your next SSD purchase.